Kancham, proud of her Tiger bag! This report is offered to friends of The Advocacy Project who donated to an appeal we launched on GlobalGiving in 2015. This appeal generated $27,123 from 211 generous donors, including yourself. 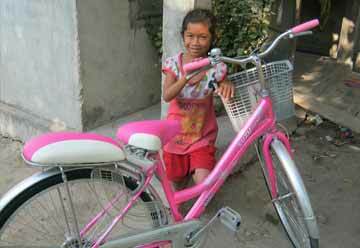 We divided the money up between three of our partners in Nepal who work for vulnerable women and children. Four years on, we want to bring you up to date on one of the groups - 35 remarkable women in the western district of Bardiya who lost loved ones to the disappearances during the conflict in Nepal (1996-2006). We have launched another four small appeals for this group since 2015. The fourth appeal is still active. Not surprisingly, the women are still haunted by memories. The group’s coordinator, Sarita, lost her father after he was falsely accused of Maoist sympathies by a relative. Sarita and her mother were then driven from the village. Sarita's husband died from a snakebite shortly afterwards. Poojah saw her father taken away by the army, never to return, and is still demanding an explanation - even though she is married to a soldier. Most older members of the group work in the fields for a pittance. They need justice. They also need money. AP was set up to support community-based associations like the Bardiya cooperative that are led by determined survivors of abuse like Sarita. But we – and the women – also understand that it will take more than determination to produce sustained benefits for the group members. And this is why they are making bags. They began in 2016 by using embroidery to describe the disappearance of their loved ones, often in graphic detail. The following year they turned from human rights to the environment, and made squares about the tigers that live in the nearby Bardiya National Park. AP brought the squares to the US where they were assembled into three delightful quilts by Bobbi, a talented quilter from North Carolina. The women of Bardiya then decided to go into business. They commissioned several shops in Kathmandu to turn their Tiger squares into bags, but were dissatisfied by the result. So they turned to Sarita, who made 30 sample bags at the end of 2018. And this is where we now stand. There is no doubt that this project has empowered these brave women. 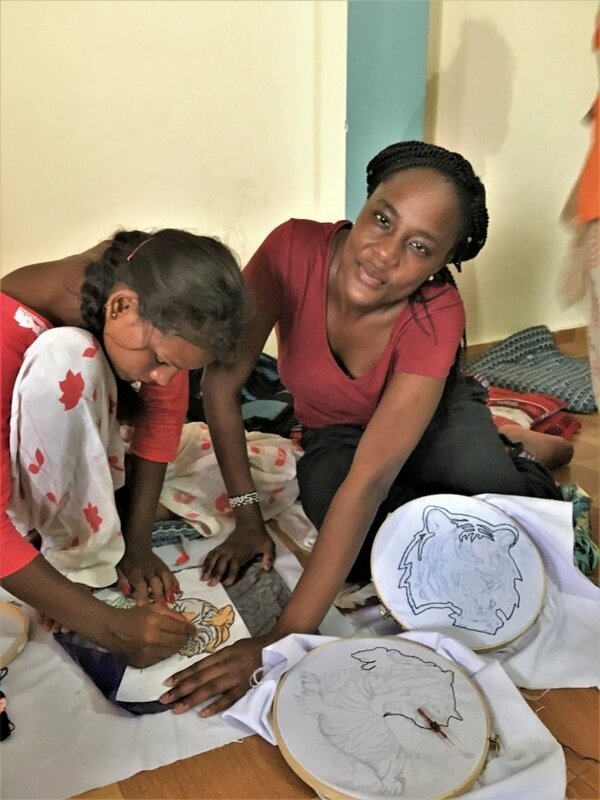 We pay $20 for each piece of embroidery, which puts money in the pockets of the women and gives them the chance to work together and learn new skills. They have shown discipline in sharing out their income at the end of the year. Helped by a new sewing machine, Sarita has become an excellent seamstress and teacher. She dreams of opening a store at the Bardiya National Park where her friends can sell tiger bags to tourists. This dream, however, will only be realized if the group can sell bags, and this is proving difficult. We do not know why. It could be the quality of the bags, or the cost of production (which includes the $20 paid to artists), or simple competition in a country where every trekker and tourist owns a bag. It is hard for AP to help from Washington, so we have decided that Bobbi the quilter and Iain from AP will visit Bardiya in April. Bobbi will help the women assemble their commemorative squares into an advocacy quilt to be exhibited in Nepal and the US. She will also advise Sarita on her bag-making – the first time (to our knowledge) that an American quilter has visited the Global South to provide such technical assistance. Iain will seek out markets at tourist lodges and shops in Kathmandu, help the cooperative to design a new business plan, and profile the group on the AP website. Whatever we raise on Global Giving will go to the cooperative. AP is committed to these women and to their vision. If they can launch a successful business they could influence the national debate in Nepal over how to compensate family-members of the disappeared, which has reached an angry stalemate. But we also understand the importance of investing your donations wisely. Right now, it hangs on finding a market. Are we on the right track? We would love to hear from you! 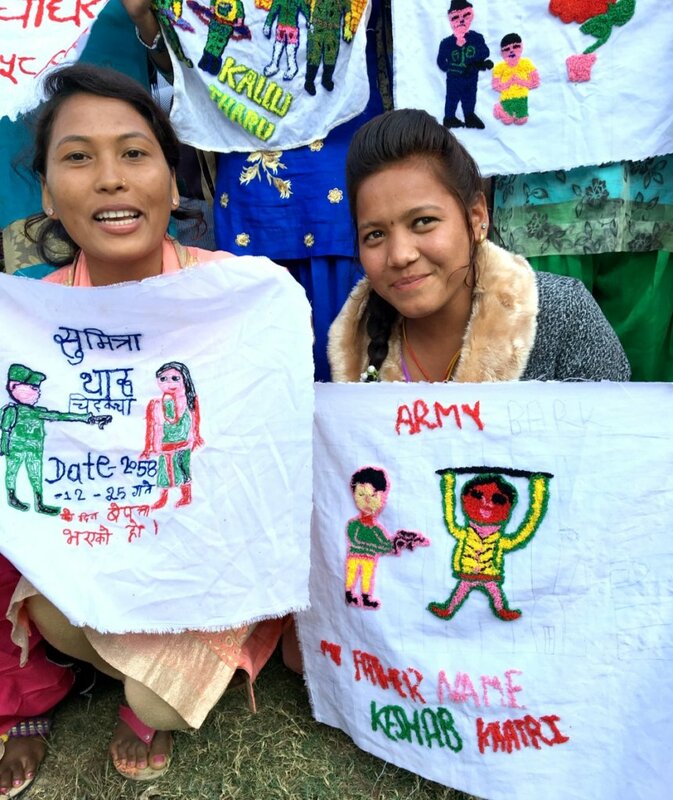 In the meantime, know that the ladies of Bardiya are deeply grateful for your support. This is the final report on our appeal for three marginalized communities that were affected by the devastating 2015 earthquake. The appeal has generated $27,106 through 262 donations and is now close to reaching our original target ($30,000). Our plan is to retire the appeal early in 2018 and launch three new appeals for our Nepali partners, whose work is more relevant than ever. We hope you will stay involved! The purpose of this email is to explain briefly how we have used your donations. While the earthquake has remained a factor, our three partners have moved past that disaster and developed innovative models for addressing the discrimination that made them so vulnerable to the earthquake in the first place. This is exciting and makes it more likely that your investment can be scaled and sustained. 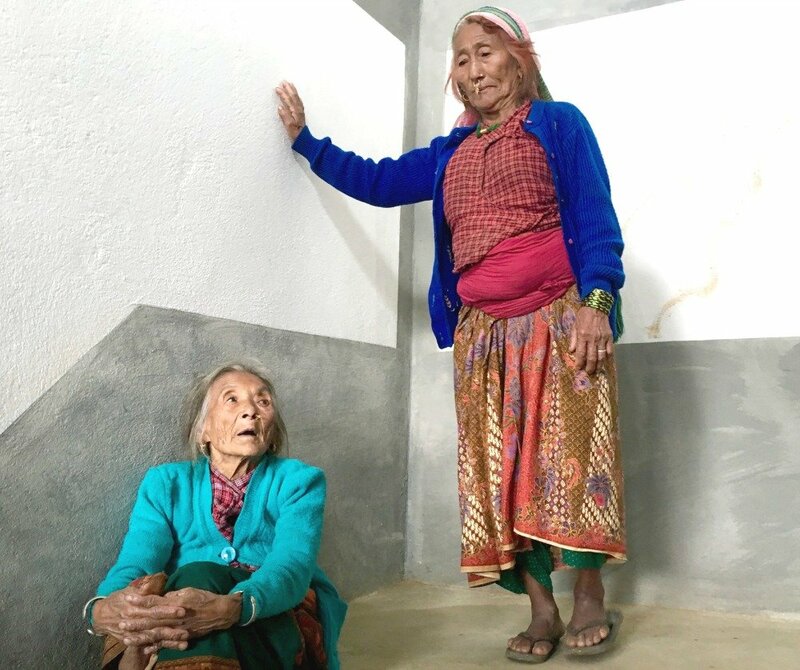 Our goal with this project is to help our partner Care Women Nepal (CWN) to improve access to health services for village women who live in the remote district of Dhankuta. This is particularly important when it comes to uterine prolapse, or fallen womb. The women of Dhankuta are particularly vulnerable because they walk long distances in a mountainous area, carry heavy loads, and often go back to work soon after giving birth. But government weakness also plays a role. During a field visit in October, we found that most government health centers (some of which were damaged by the earthquake) cannot even diagnose, let alone treat, prolapse. The Dhankuta hospital has only 20 beds and does not have a resident gynecologist who can perform surgeries. CWN’s approach is to screen women for prolapse and other medical ailments at health camps. The camps are staffed by medical specialists from larger hospitals outside Dhankuta who know Indira Thapa (photo above), the founder of CWN and are only too happy to practice their skills, as we explain in this recent news bulletin. 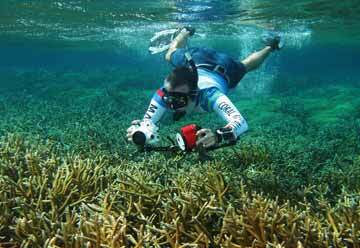 CWN is also able to mobilize a large team of volunteers to help. Women with mild prolapse receive a pessary while those with third degree prolapse are placed on a waiting list for surgery. Click on this video to see how the camps work. CWN has screened 4,975 women at 6 camps since 2015. Around thirty have undergone surgery for prolapse and thousands more have benefitted from other interventions, including cataract surgery, after attending a camp (photo). This wonderful project has been well served by three Peace Fellows, who provided technical support and raised their own funds. Our 2017 Fellow Rachel Pettit, a student at Sciences Po in Paris, raised $2,588. 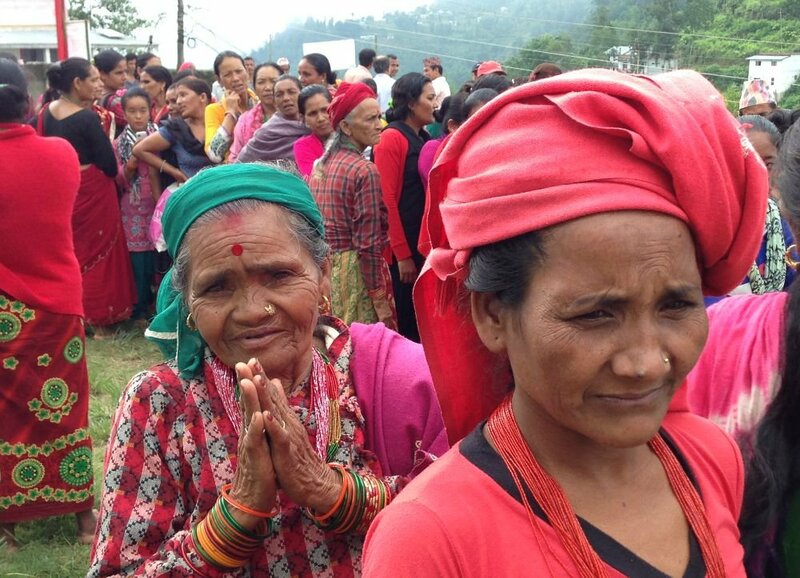 In all, we have raised $26,592 for Care Women Nepal - more than twice the amount we received through our 2015 appeal. And we still have more than $8,000 in our CWN account – enough to fund another health camp in 2018. At the same time, we are determined that the next camp will strengthen the government health system, which is the only way to reach all women in Dhankuta. The camp will be organized jointly by CWN and the Dhankuta hospital. They will choose the doctors together and make sure that nurses from the hospital and health centers receive prolapse training in the process. They will also use the camp to develop patient records, which can be followed up by hospital staff. Finally, CWN will help the Dhankuta hospital to coordinate prolapse surgeries with larger hospitals. If this can be achieved, we will have put in place a system that can benefit thousands of vulnerable women in Dhankuta – a wonderful way to build on your donation. We will launch a new appeal for CWN on Global Giving in the new year. Our second partner CONCERN takes children out of the brick factories and places them in school. 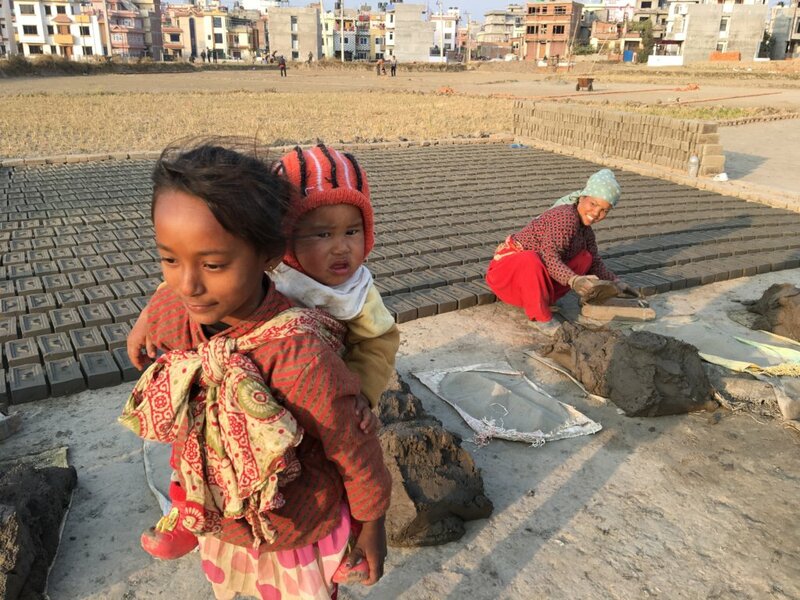 As we have explained in previous reports and through videos, children as young as three are flipping bricks in violation of Nepali law which forbids the employment of children under the age of 16. While they are no doubt helping out their parents, this work is abusive, dangerous and illegal. Our goal has been to place 50 brick children in school for at least five years, which is probably long enough to ensure that the children will not return to bricks. We also want to ensure that the children enjoy a good education. Once the model is developed we hope to apply it on a broader scale in seven factories. How have we done? We placed fifty children in school in 2015 and posted their profiles online. We placed 50 children in school again this year for the third year running, although we had to replace 6 children who left the area and one child who moved on to secondary school. CONCERN also began working with two new schools. Our 2017 Peace Fellow Cynthia Boruchowicz met with 44 of the 50 children this summer and updated their profiles for our website. During her interviews, Cynthia – a PHD student at the University of Maryland – learned that some children had gone back to flipping bricks after they returned from school. As a result, we will fund extra tuition next year at the Suryodaya Balbikas primary school in Bhaktapur. 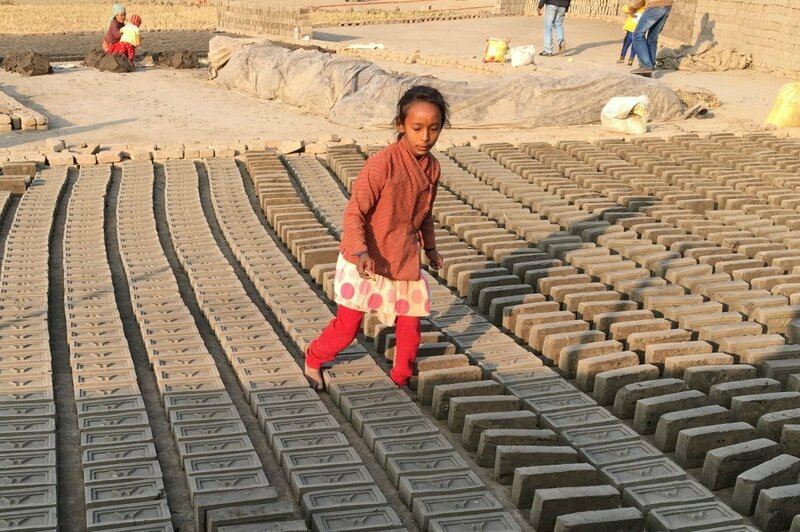 This should help children like Sanu who live in a brick factory, to complete their homework and stop work completely after school (photo). If it works we can expand tuition in 2019. Such adjustments are possible because – once again - we have used your donations to leverage more funding. Since 2015 we have raised $21,162 for CONCERN, and still have over $3,000 left as we head into 2018. As with Care Women Nepal, we plan to launch a new appeal for this project in early 2018. The biggest challenge is to scale up the model and change policy or behavior. That will probably not happen until CONCERN can engage directly with the factory owners, who wield enormous power. That will be very much on our agenda for next year. The Maoist rebellion (1996-2006) triggered a vicious conflict in Nepal and led to the disappearance of over 1,500 Nepalis who have never reappeared. Several of their families also lost homes to the earthquake. The question was - how could we help? At the suggestion of the family members we began in 2015 by offering training in embroidery. 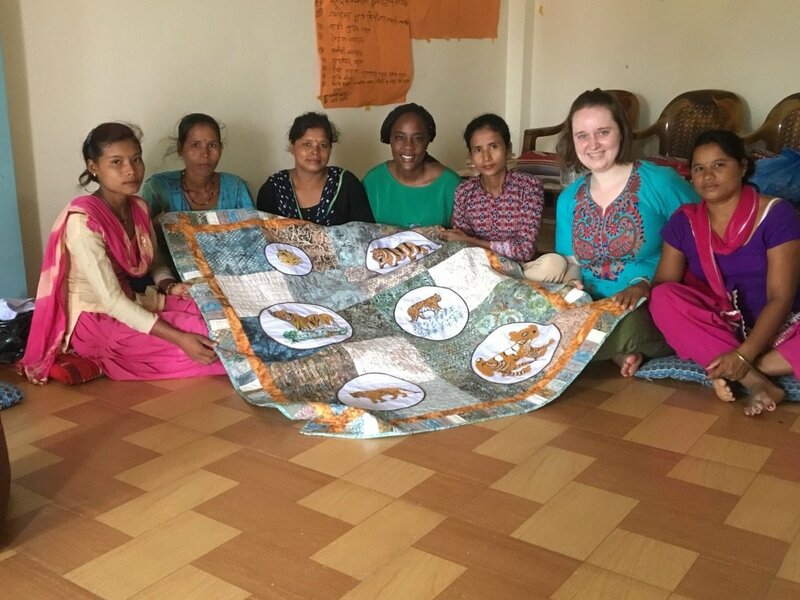 This kicked into high gear in 2016 when our Peace Fellow Megan Keeling from the Fletcher School at Tufts University arranged training for a group of wives in Bardiya, who produced embroidered squares about their husbands. These are being assembled into an advocacy quilt which will be shown at events in Nepal in 2018. AP then suggested that the family members produce embroidery for sale. 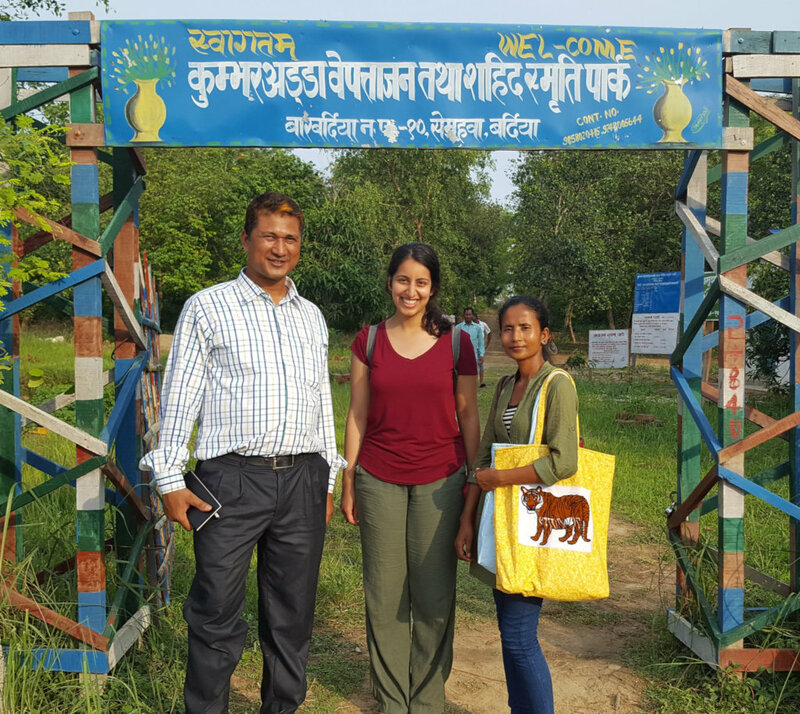 In the summer of 2017 our two Fellows Kirstin and Vicky visited Bardiya and helped 25 women to form a cooperative. 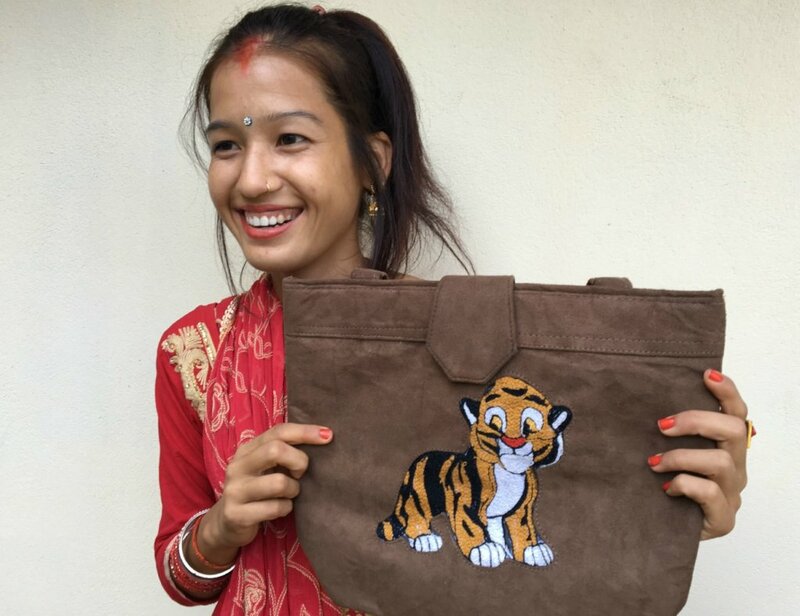 Coop members like Pooja (photo) produced a series of tiger designs, which were taken to Kathmandu by their coordinator, Sarita, and turned into sample bags by tailors (photo). Making these bags has done wonders for morale, as we explain in this recent bulletin. The Bardiya group hopes to produce 50 more bags by next summer, for sale in Nepal or the US. We are also funding training for the inspiring leader of the cooperative, Sarita Thapa (whose own father disappeared), in how to make bags. Parallel to this, we have invested in strengthening the cooperative, which now has legal statutes, a bank account and elected officers. We have also recruited an English-speaking student, Prabal, to help them manage the project. Since 2015 we have raised just over $11,000 for the cooperative and still have $2,280 to spend next year. The Bardiya family members are represented by a network, NEFAD, and our other goal for 2018 is to help NEFAD lobby for justice. This will be difficult because politics in Nepal is confused but we hope to have a plan by early 2018 and may ask the UN to intervene. We will post a new appeal on Global Giving for the Bardiya wives in 2018. It has been an enormous privilege to support these dedicated men and women during the past three years. You can be very proud of the way they have used your generous donations. We do hope you will stay involved! Wishing you a very happy holiday and a prosperous new year. And again, thank you for your generosity. I am delighted to report back on how we are using your generous donation to this important appeal, which we launched in June 2015 following the devastating earthquake in Nepal. This is our eighth report. Much has happened since we were last in touch. Goals and beneficiaries. Our aim is to support and empower three highly disadvantaged groups - children who work in the brick factories; village women at risk from uterine prolapse; and wives of those who disappeared in the conflict (1996-2006). As we have explained in previous reports, many of these families lost homes in the quake or felt the sting when government services were damaged by the quake. But the real problem is that they were already vulnerable before the earthquake and were pushed deeper into poverty by the disaster. This is what we are trying to change. We work with these groups through three community-based organizations that advocate for them – Care Women Nepal; NEFAD; and CONCERN. Money: So far, we have raised $26,330 from 247 donations through GlobalGiving. 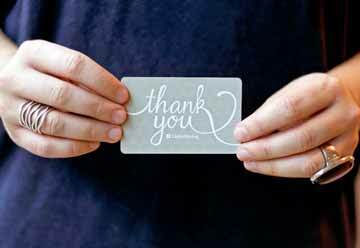 Many of you have donated several times and also gave to the 2-year matching appeal that we joined on April 15. Thank you! But we have also used your donations to leverage larger amounts of money for the program. In addition, several of our wonderful Peace Fellows, who have served in Nepal, have also launched their own micro-projects on GlobalGiving. Click on the following names to see the appeals of the 2017 Fellows: Kirstin and Vicky; Rachel and Cynthia. Rachel is pictured above on a field trip to the district of Dhankuta. 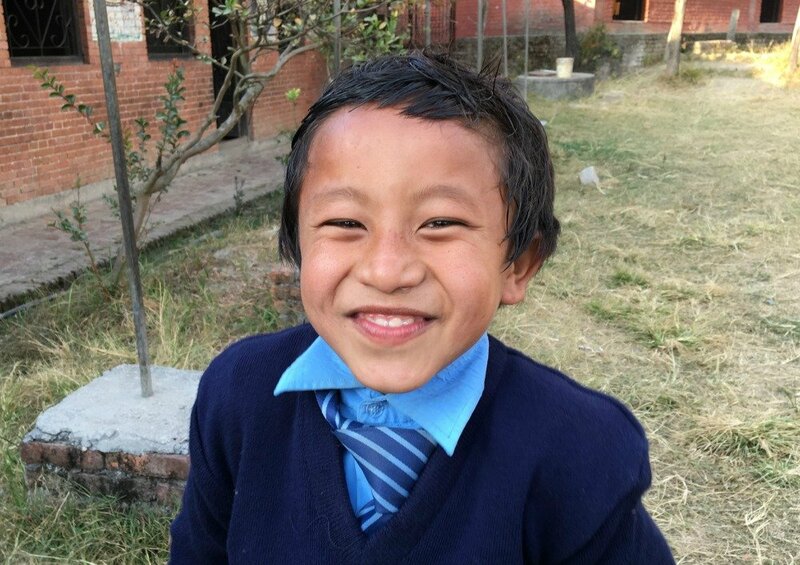 In all, we have transferred $40,401.63 to our three partners in Nepal, and still have another $8,000 in the pipeline. We have deployed ten Peace Fellows, and sent three AP missions to Nepal to advise our partners on managing their funds and planning for the future. Protecting women’s reproductive health in Dhankuta. This project helps Care Women Nepal (CWN) to screen women in the district of Dhankuta against the dangerous and debilitating condition of uterine prolapse. CWN has organized 9 health camps and screened 5,770 villagers since we started working together. We recently posted a video film on the 2015 health camp, which found that 20% of the women screened suffered from prolapse. CWN's health camps serve as an essential intermediary between the government and these remote villages. This is a huge achievement! Still, it does not go far enough and we now plan to use what remains in our appeal to strengthen the Dhankuta government services – which is the only way to reach a critical mass of beneficiaries in a sustained way. This will be done by inviting government health centers to participate in and learn from the next camp, which will take place in October in Pakhribas. We have also developed a schedule of prolapse surgeries for the Dhankuta hospital which should make it easier for the hospital to operate on women with uncurable prolapse. Finally, we have helped CWN to hire new staff and develop a strategic plan to make the organization stronger and more sustainable. We will report back after the October health camp. In the meantime, learn more through the blogs of this year’s CWN Peace Fellow, Rachel, pictured above. Enrolling brick children in school: Following the earthquake we took the decision to enroll 50 children from the brick factories in school. The children were selected by our partner CONCERN, and are profiled on the “Rescued!” tab on this page. We have continued to support the same 50 children on the advice of CONCERN, which argues that sustained education over a period of years is the only way to make sure a child can really escape from bricks. We have followed up with all of the children each year to make sure that they are receiving a good education. This year, we entrusted this work to a very experienced Peace Fellow, Cynthia, who is studying for a PHD at the University of Maryland. Cynthia has met with all 50 students and their teachers, and we look forward to getting her recommendations. She is pictured below with four students at the Faidhoka school. I strongly recommend her sparkling blogs. Parallel to this, we are helping CONCERN to apply the same approach to a larger and more ambitious program that would abolish child labor from seven large factories in the Kathmandu Valley. We hope to meet with the factory owners in October. Empowering wives of the disappeared: Our goal with this third project is to help some of the 1,450 families that lost loved ones to disappearances during one of the darkest periods of Nepal’s recent history. The beneficiaries were selected by our partner, the National Network of Families of Disappeared and Missing Nepal (NEFAD). In 2015, your donations made it possible for 44 wives to produce embroidered squares in memory of their husbands. Most of the women live in the district of Bardiya and their squares are now being assembled into quilts in New Jersey. 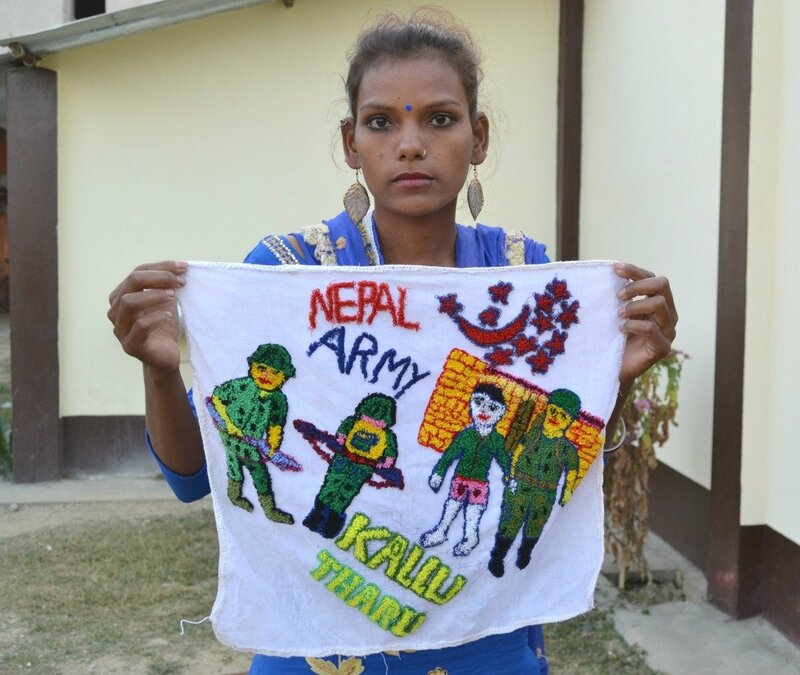 The quilts will eventually be shown in Nepal, in support of the campaign for justice. But while these memorial quilts will serve as a powerful statement, they will not pay the bills. 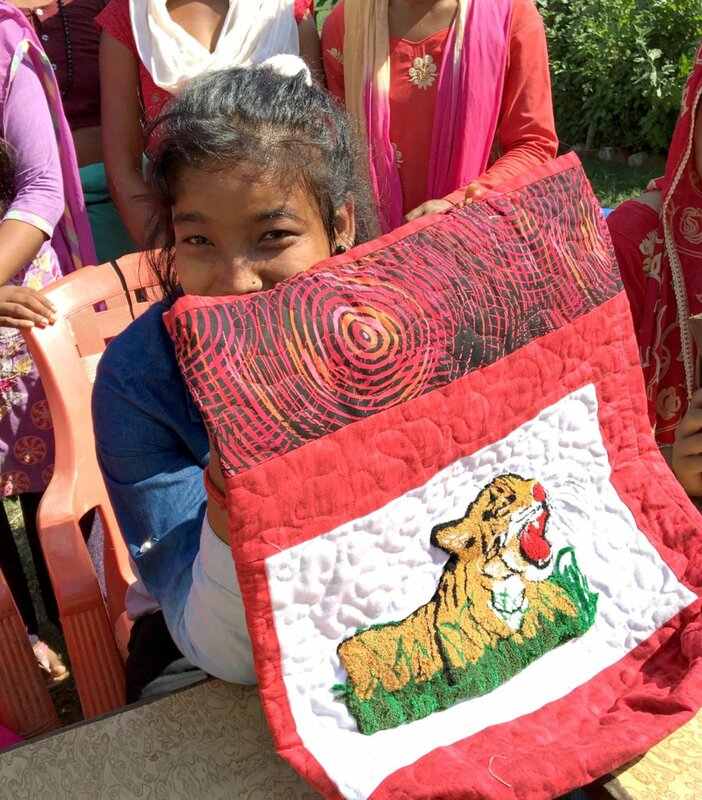 As a result, we have also commissioned embroidered squares from the Bardiya wives that feature a tiger, which is found in the Bardiya national park and is a favorite of tourists.The squares will be turned into tote bags by a tailor and – we hope - sold at the Bardiya park and tourist agencies in Kathmandu. Any profits will be invested in the business. This work has progressed well this summer. We have sent two accomplished Fellows, Kirstin and Vicky, pictured below, to help the wives write a business plan, organize training, and open a bank account. They are supported by Prabal, a student at Tribhuvan University and Sarita (photo) who lost her father to the disappearances. Kirstin and Vicky have also updated the NEFAD website, which showcases the many articles of NEFAD’s inspiring director, Ram. Like the other two projects to come out of our 2015 earthquake appeal, we feel that this work with NEFAD adds up to a well-rounded program that stands a good chance of being sustained and scaled. Next steps: Our 2015 earthquake appeal is close to being fully funded. Once we reach this milestone we plan to bid the appeal farewell and replace it with three new appeals on GlobalGiving for our three partners in Nepal. This seems to make sense as the memory of the earthquake recedes and the projects themselves head in different directions. Finally, it is safe to say that our hard-working 2017 Peace Fellows, who feature in this report, will continue to help even as they make use of their experience in Nepal at school. Rachel has already left Nepal for Geneva, where she will intern at the office of the UN High Commissioner for Human Rights before returning to her university Science Po in Paris. Kirstin and Vicky will be giving presentations and writing papers at Georgetown University and The Fletcher School (Tufts University) respectively. Cynthia will apply the M and E tools she developed at CONCERN to her PHD research at Maryland University. In other words, in helping Nepalis your donations have also made this a memorable summer for four impressive graduate students from the US and Europe. It is another happy by-product of a successful appeal. Watch this video on a CWN health camp! This is the seventh time we have reported back on the Nepal appeal, launched on GlobalGiving in June 2015. In this report we look ahead to the anniversary of the earthquake (April 25, 2017) and ask what has been achieved and what still remains to be done. We will also share our plans for sustaining this program once emergency funds run out. Our goal in launching this appeal was to help three communities in Nepal that have suffered from deep discrimination and poverty: village women who live in the isolated district of Dhankuta; children who work in the brick factories; and wives of those who disappeared during the Maoist rebellion (1996-2006). The poverty and isolation of these three communities made them even more vulnerable when the earthquake struck on April 25. For example, many families that lived in the hilly districts lost their homes and were forced to head south and seek work in the brick factories near Kathmandu. Their children included Rojina, pictured above. Many wives of the disappeared were also affected by the disaster. We reported in 2015 on Shobha, pictured below, whose husband Shyam was taken by Maoists in 2001 never to reappear. The earthquake took away most of Shobha’s house in 2015, leaving her to struggle with yet more loss. Faced by this, we set five goals for our appeal. First, we would address the underlying poverty of these three communities, as well as the emergency. Second, we would work through three trusted Nepali partner organizations: Care Women Nepal, CONCERN, and the National Network of Families of the Disappeared Nepal (NEFAD). Third, we would dispense donations quickly but responsibly, and avoid the way international earthquake aid has been bogged down by bureaucracy. (Of the $3.4 billion sent to Nepal after the earthquake, only $276.4 million has reached affected families.) Fourth, we would use your donations to leverage other funding. Finally, we would support programs that could be sustained after the emergency funding runs out. Bearing these qualifications in mind, how have we done? A) Funding: 148 donors have given $12,700 towards our target of $15,000 – thank you! But we have also used this to leverage an additional $33,000, some of it through separate microprojects on Global Giving. 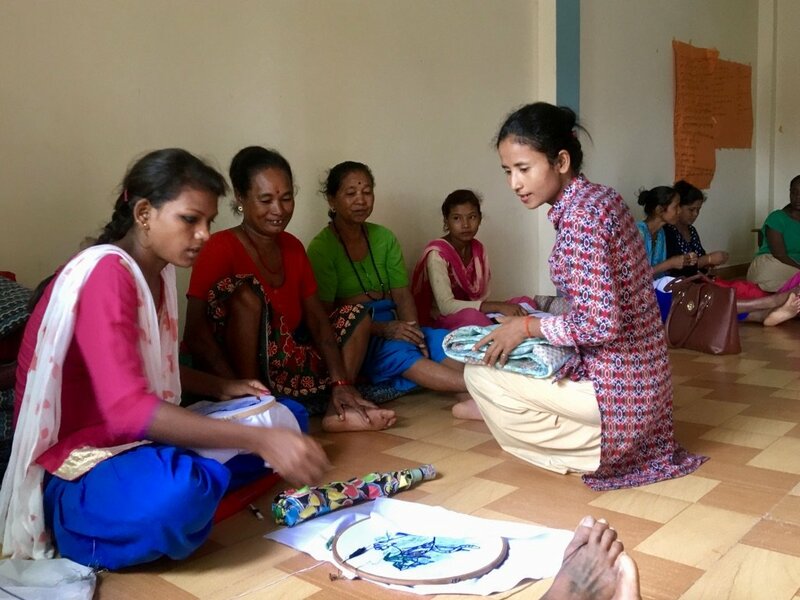 B) Working through representative partners – Wives of the disappeared: Your donations have enabled NEFAD to train 35 wives in the district of Bardiya to make embroidery and launch a handicrafts cooperative. Under the leadership of Sarita, who lost her father, the ladies have produced 35 somber squares that commemorate their disappeared family members and 35 more light-hearted squares on the theme of tigers (photo). Both sets are being assembled into quilts by experts in the US. 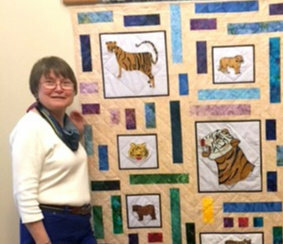 The memorial quilts will be exhibited in the US and Nepal while the tiger quilts will, we hope, be sold. Parallel to this we have helped the wives of Bardiya to demand justice through advocacy and the media. We were relieved when a government commission on the disappearances was extended for another year on February 9. Brick children: Working through CONCERN, we have placed 50 brick children in school for two school years. As we reported in January, almost all of these children have stopped working in factories and several are getting excellent grades at school. They included Rojina, who left the district of Ramechhap after the earthquake destroyed the family home, expecting to work in bricks. Instead, Rojina went to the Faidhoka school. When we visited in December, she was top of her class. (photo above). Isolated village women: Care Women Nepal, our local partner in the district of Dhankuta has organized five health camps for over 5,000 villagers since April 2015 (photo). Some of these women lost their homes in the earthquake and most found that government health centers were even more isolated and difficult to reach after the quake. CWN's health camps provide comprehensive screening. C) Disbursement and monitoring: We transferred money to the three partners well in advance of these planned activities and deployed five Peace Fellows (graduate volunteers) to help them collect receipts and report back on expenditure. Our Fellows - Maya, Joti, Megan, Lauren (photo) and Morgan – put up with tough conditions to get the job done and we urge you to check out their blogs and photos. We will send three new Fellows to Nepal this coming summer, and will report back to you once they get settled in. D) Ensuring sustainability: In other words, the last two years have given shape to three promising programs and produced some impressive results. The question is, how can we keep up the momentum as the memory of the earthquake recedes? We will begin by raising our target on Global Giving from $15,000 to $30,000, to take advantage of special fundraising opportunities and ensure that the three programs have seed money..
At the same time, we will start planning for the long-term. For example, we will continue to train the wives of Bardiya in embroidery and open an online store for their Tiger quilts. But we will also train them to collect ante-mortem data on their disappeared relatives, which could help the government commission to exhume graves and identify the dead - the only thing that can really end their anguish.. Similarly, our second partner Care Women Nepal has shown its ability to organize health camps and this should continue. But one-off health camps cannot substitute for a government health system. 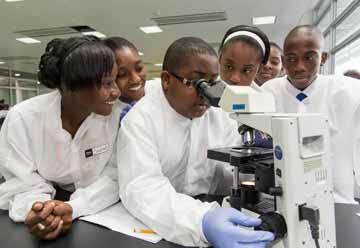 As a result, CWN will use this summer’s camp to train government health officials and help the district hospital to develop a year-round schedule for prolapse surgeries. This will help the hospital to make better use of its limited team of gynecologists. Our third partner, CONCERN, will continue to place brick children in school. But this may not be enough, because our studies have shown that children who live in the factories are often called on to “flip” bricks after they return home from school. As a result, we hope to provide extra tuition for such children at our three participating schools. CONCERN also hopes to open day-care centers in factories, where infants can receive nutrition and supervision instead of being drawn into making bricks. All of this, we hope, will begin to address the deeper structural poverty that made these families vulnerable to the 2015 earthquake and continues to cause so much misery. Of course, we are only working with a small number of beneficiaries. But if our three Nepali partners can continue to show the way forward, they may convince others with a larger footprint – starting with the Nepali government. Were that to happen, your generous donations would have helped to launch a new and more responsive approach to development. That is our ultimate goal, and we hope to achieve it with your support. This is the sixth time we have reported on our Nepal appeal, launched through Global Giving in June 2015 following the devastating earthquake. 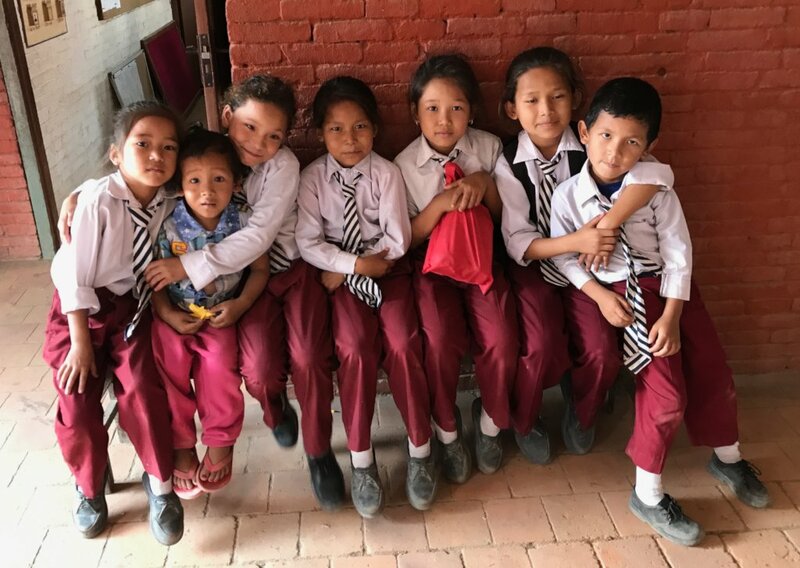 Our goal is to support three of our Nepali partners – Care Women Nepal, CONCERN and NEFAD - who work with village women in eastern Nepal, children from the brick factories, and wives of those who disappeared during the Maoist insurgency (1996-2006). Many of these stakeholders were affected by the earthquake. Eighteen months have passed since we launched this appeal and there is much to report. First, our donors continue to give. Thank you! To date, the appeal has attracted $12,349 from 142 donors. We have also raised another $30,000 for the program through other channels. Second, the earthquake continues to drive Nepalis into poverty. For example, of the 51 children rescued from brick kilns by this program, ten came from families that lost homes in the earthquake. This left them with no option but to seek work in bricks. Sadly, much of the reconstruction aid that went to Nepal last year remains unspent because of red tape. This makes our community-based approach – and your targeted donations – that much more important. Third, our entire team at The Advocacy Project has been intensively involved in this program. We have deployed six outstanding graduate volunteers (Peace Fellows) to the partners and visited the districts of Bardiya, Ramechhap, Dhankuta, Bhaktapur and Lalitpur in person to meet with stakeholders. This has also been a two-way partnership. From our side, AP has contributed funds and technical support. But we have taken our lead from the partners, who have provided us with extraordinary access to their work and our stakeholders. We have learned so much in the process. Finally, there is the programmatic side. This report rounds off 18 months of hard work, and we can confirm that your donations have been spent in an exemplary fashion. But it does not stop here. Our three partners now face the challenge of sustaining and building on what they have achieved with your help. This is now well under way. We will maintain this appeal on Global Giving to anchor our future work in Nepal and look forward to reporting back to you. Your affection for Nepal and its people will keep us motivated and focussed! CWN screens village women for uterine prolapse in the isolated eastern district of Dhankuta, and your donations have allowed CWN to screen over 3,000 women since 2015. In 2016, we funded two camps and screened 1,960 villagers, at a cost of $9,235.90. CWN’s team of volunteers (which included government specialists) identified 40 women with early prolapse and provided them with ring pessaries. Another 55 women were found to have third degree prolapse and placed on a waiting list for surgery. We funded four surgeries. 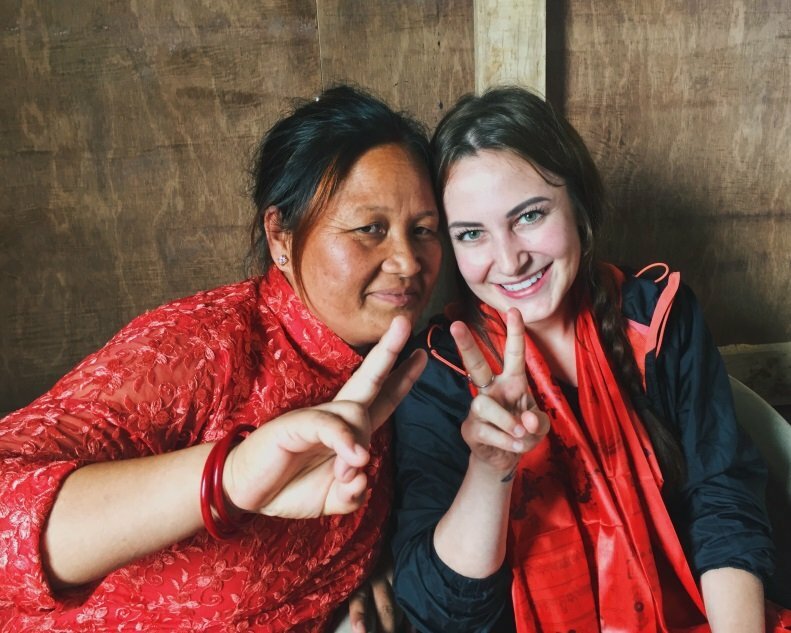 We asked our Peace Fellow, Morgan, to observe this process closely and you will get a good flavor of her conclusions through her blogs and photos. These show that any concerns about surgery are outweighed by the impact of prolapse. One beneficiary, Dhanmaya, 52, pictured in the photo below, lived with prolapse for 22 years and opted for surgery after giving birth painfully to five children (at her husband’s insistence). 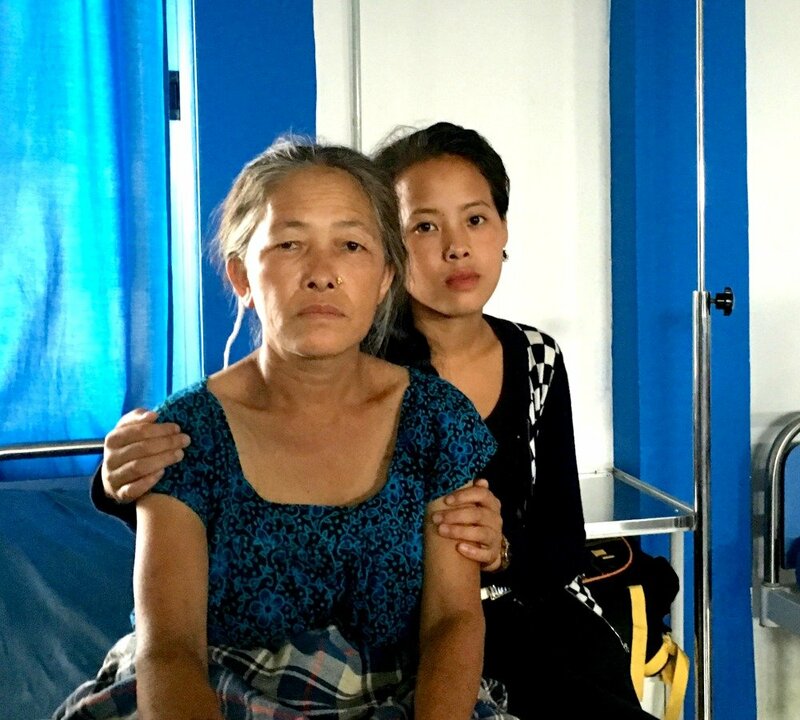 Morgan’s photo shows her recovering with a relative, whose presence was made possible by Care Women Nepal. CWN does what it can to make the surgery less frightening. Later, Morgan also met with the indomitable surgeon, who even invited her to photgraph an extracted uterus. This is not for the squeamish, but shows Morgan's commitment to her subjet. She was the only undergaduate recruited for our fellowship program in 2016 and showed poise throughout. 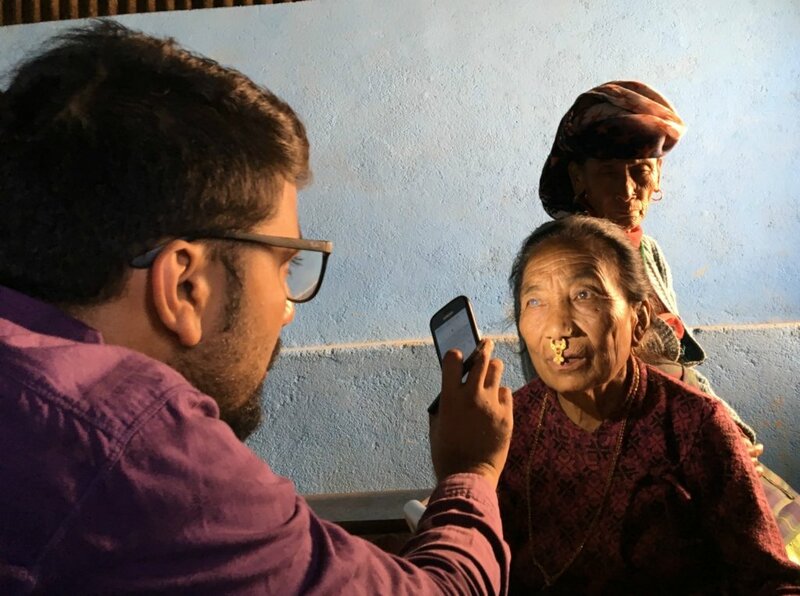 CWN's health camps perform an indispensable role by making government services accessible to isolated villagers, but they could have more of an impact if they were more integrated into village life and the government system. The same can be said of the prolapse surgeries, which have to be performed at government district hospitals. The problem is that Dhankuta’s only trained gynecologist was transferred in 2016, whch meant that CWN's surgeries had to be squeezed into a busy schedule in another district. This is why we were only able to finance four surgeries. Care Women Nepal needs to work without interruption throughout the year if it is to provide systematic support to the government medical services and this will require a full-time program officer to take the load off Indira, CWN’s tireless director. This is one of our three goals for 2017. The other two are to fund another health camp and support at least 15 surgeries. The cost should not exceed $12,000, and we already have over $7,000 in the CWN account. Supporting material: Morgan's blogs and photos. This program has allowed CONCERN to place 51 children in school since 2015. They include ten year-old Haris, pictured above. All of the children would have worked in a brick factory, in violation of the law and at grave risk to their health, if they not gone to school. AP has helped to raise almost $13,000 for this important program through Global Giving. The Global Fund for Children contributed $5,000. Lauren, who served at CONCERN as a Peace Fellow in 2016, raised another $2,875 through her own mircroproject. We are grateful to CONCERN for its wholehearted collaboraton. In August 2015, an AP team visited the remote district of Ramechhap, which exports families to the brick factories, and saw first-hand how poverty forces families to work in bricks. By placing their children in school, CONCERN gives parents a reason to say no to bricks and remain in their village. The AP team also met with the dedicated staff at the Panchakanya village school, where 13 children are enrolled. In 2016, we worked at both ends of the brick traffic. Our Peace Fellow Lauren also visited Ramechhap and profiled the 13 young students for our website. 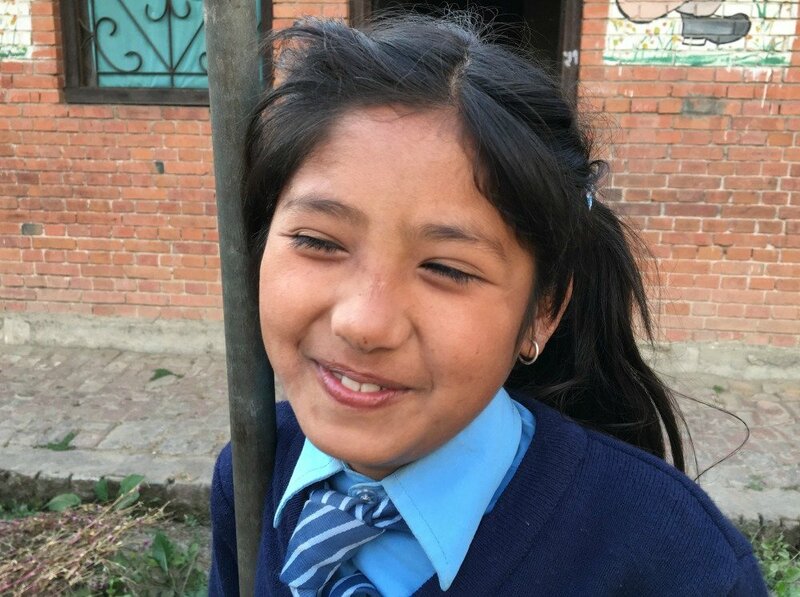 She then went down into the Kathmandu valley, to the districts of Lalitpur and Bhaktapur, where the rest of the students are enrolled. You can read her profiles here. Iain from AP, followed Lauren in November after the brick-making season had started and visited three factories. We recommend his video footage, which shows children at work. The biggest problem is that the entire family is paid by the number of bricks produced, so everyone is expected to contribute. Children play an important role because their small fingers can get between the rows and flip bricks. CONCERN’s school program project is certainly making a difference. Iain visited two of the collaborating schools, Faidoka and Suryodaya, and met with 15 children. Twelve had stopped work completely and several were getting excellent grades, but the three remaining children have been less lucky. Sanu, 11, works for two houra a day before going to school. Budhi Ram, who is pictured below, also works before school. This undoubtedly affects their academic work, but will be hard to stop completely because they live with their families in a factory. This suggests that there is more to ending child labor than school, important though school may be. As a result, CONCERN and AP will take a more comprehensive approach in 2017. We hope to place the 51 children in school again, but if funding permits we will also organize extra tuition for the students who live in the factories to help with their homework. CONCERN will also work with seven progressive factory owners to improve living conditions in their factories. Iain met with one owner who has built a dormitory for his workers, installed water and put up a day-care center for infants - all at CONCERN’s urging. We think such owners may be even more receptive because the brick industry is under growing pressure from environmentalists. Supporting material: a) Iain’s video of children at work in the brick factories; b) Lauren’s photos and blogs; c) Profiles of the 51 children now at school; d) a recent news bulletin by AP. Working through CONCERN, AP has invested $5,093.20 in wives of those who disappeared between 1996 and 2006. Of this, $500 came from our Peace Fellow Megan who worked at NEFAD in 2016 and launched her own microproject on Global Giving. Most of the disappearances in Nepal occurred in the western district of Bardiya, and this is where we have focused our efforts. NEFAD and AP agreed at the outset that we would train around 40 wives to tell their story through embroidery – something that would be both therapeutic and develop a useful skill. This work began in 2015 with a small number of wives, but NEFAD was unable to reach Bardiya because of serious flooding, so we had to make up for lost time in 2016. 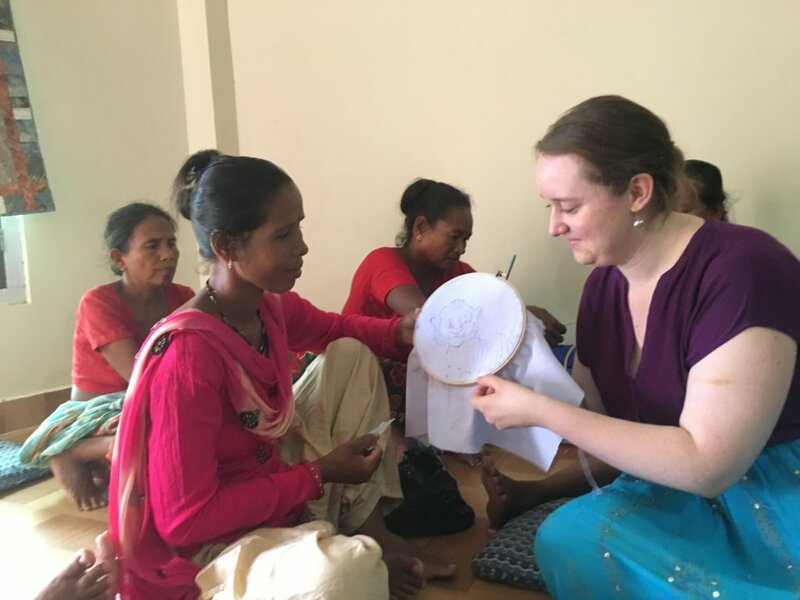 Megan visited Bardiya in June and organized embroidery training for 35 women under the watchful eye of Sarita, a skilled seamstress who herself lost a father to the disappearances. The women produced powerful squares, some of which were exhibited in Kathmandu on August 30 – International Day of the Disappeared. Iain from AP visited Bardiya in December, collected the 35 finished squares, and profiled the 35 artists. They included Gita, who commemorated her disappeared brother through a powerful image, as shown below in the photo. (Gita’s profile will be shown with the others on the AP web site). 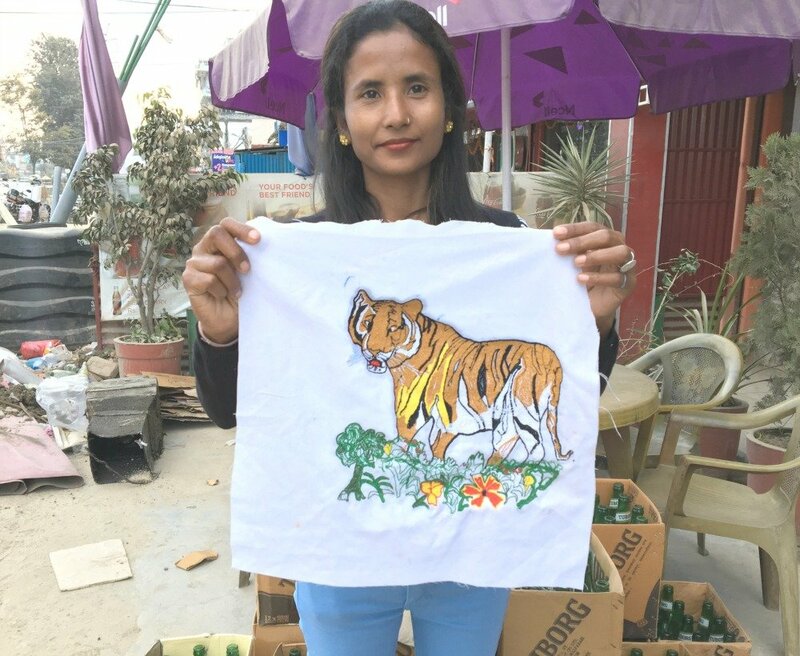 The Bardiya artists also produced a second batch of squares featuring tigers, which are native to Bardiya. AP has brought the squares back to the US and will work with quilting gulds to assemble the squares into quilts. The memorial quilts will eventually return to Nepal, where they will help the campaign for transitional justice. The Tiger qults will hopefully be sold – with any profit going back to the artists. These women certainly need money after losing the breadwinner in the family, but it is important that any income-generation project be sustained. Nor should we forget their main goal - to find out what hapened to their loved ones. This points to our two goals for 2017. First, sell embroidery for the wives. Second, make sure that the voices of these brave women are heard at a time when transitional justice in Nepal hangs in the balance. We argued this case in a recent opinion piece in the Kathmandu Post, whch started a discussion, and will continue to support the wives through NEFAD in 2017. All of this points to an exciting year ahead for our partners in Nepal, for AP and for our 2017 Peace Fellows. We hope you will remain engaged! Our warmest thanks and best wishes for the New Year. Supporting material: a) Megan's blogs and photos; b) AP's Oped in the Kathmandu Post.